Washington, DC–Palestinians and supporters gathered at the White House on Sunday afternoon to rebuke the lobby American-Israel Political Affairs Committee (AIPAC), for its lopsided influence over U.S. governmental policy. Speakers called out its role in supporting Israeli government policies affecting the Occupied Territories, which they say mimic apartheid policies of the South Africa National Party from 1948 until the 1990s. The protesters voiced opposition to Israeli occupation of Palestinian Territories, the lack of access to basic needs, continued military attacks and incursions into the Gaza Strip, unequal application of law between Israel and the occupied territories, and Israel for denying Palestinians their basic right to return to their land. Several hundred took part in the demonstration. 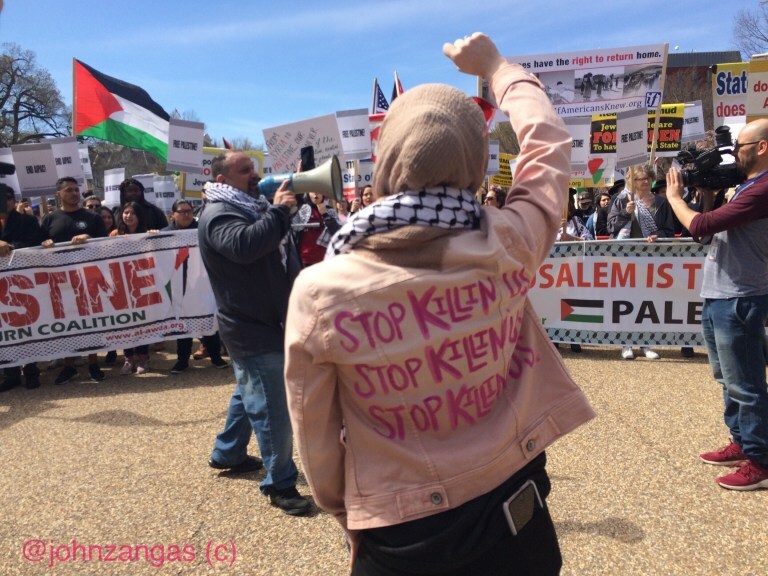 As they walked in procession to the D.C. Convention center, their chanted in opposition to heavy-handed Israeli military actions against the residents of Gaza. They demanded freedom for its residents and access to basic human necessities such as medical care, food, and water. When they arrived at the D.C. Convention center, several AIPAC attendees came outside the convention center to confront them. This resulted in heated exchanges, but there were no physical confrontations as in previous years, and there were no arrests reported. Protesters were blocked outside the convention center by two lines of orange police barricades. A reduced cadre of police officers stood between the barricades and the convention center as compared to previous years the protest was held. Mariam Abou Ghazala, activist and speaker at the rally, wore a pink jacket which she had painted “Stop killing us” in purple on its back. “We stand against occupation in a racist state that spews hatred,” she said. “This isn’t just an occupation or a genocide, this is a war crime,” she said. Medea Benjamin, co-founder of CODEPINK: Women For Peace, said that this year is different from past years in that “AIPAC is being seen more as a right-wing Republican organization and losing more of its Democratic base of support.” Benjamin based that assertion on the fact that the Democratic presidential candidates had “pulled out” of commitments and decided not to speak at this year’s conferences. 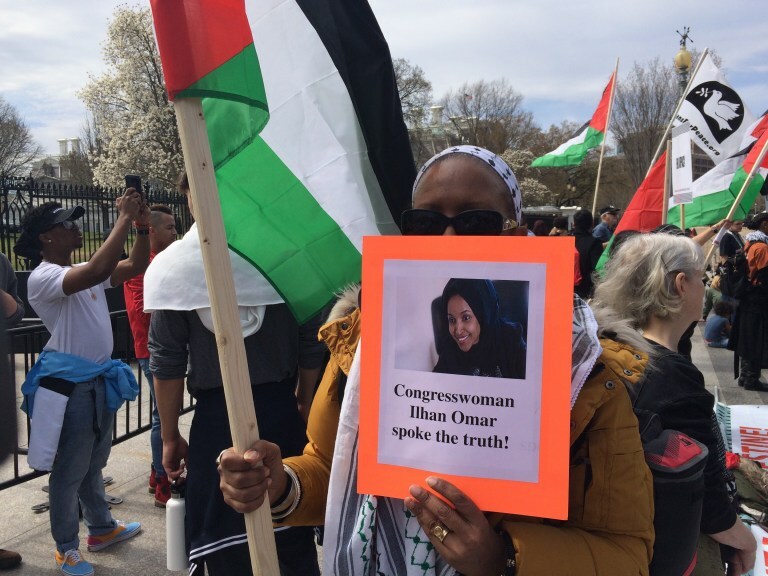 The policies that AIPAC has been espousing have been called into question, especially after freshman member of Congress Ilhan Omar first called out AIPAC’s strong influence on lawmakers and began a discussion within the Democratic Party. Democrats had to decide whether they were going to support her or call her out as an anti-Semite in deference to AIPAC. According to Benjamin, there is more of an undercurrent against AIPAC’s policy initiatives than in previous years, despite its great power.